Born May 30 18301,2,5,7,9,10,11, Yadkin County, North Carolina1,2,5,7,9,10,11 [Surry County, North Carolina6]. Married in Petaluma, June [sic] 1, 1864, at the residence of John TAYLOR; Edward C. Henshaw to Lou Taylor. Hinshaw, Edward, age 40, born in North Carolina; farmer; $12,400 real estate, $5,000 personal property. Hinshaw, Maria L., age 28, born in Missouri; keeping house. Hinshaw, James N., age 5, born in California. Hinshaw, Bright B., age 2, born in California. Benton, Mary, age 12, born in California; attended school. Hutchings, (unclear), male, age 54, born in North Carolina; farm laborer. Eastman, Wm, age 21, born in New York; farm laborer. Russel, Wm, age 14, born in Mexico; farm laborer. Sanders, James, age 40, born in Missouri; farm laborer. Hinshaw, Ed, age 50, born in North Carolina; parents born in North Carolina; farmer. Hinshaw, Maria, wife, age 37, born in Missouri; parents born in Kentucky; keeping house. Hinshaw, James Ney, son, age 15, born in California; father born in North Carolina; mother born in Missouri; attended school. Hinshaw, Bright Burnet, son, age 12, born in California; father born in North Carolina; mother born in Missouri; attended school. 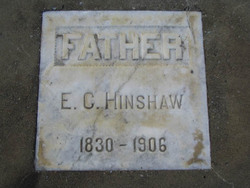 Hinshaw, Fanny D., daughter, age 3, born in California; father born in North Carolina; mother born in Missouri. Gibb, Florence, servant, age 18, born in New York; single; servant. Wood, Wiley, laborer, age 19, born in Missouri; single; laborer. Henshaw, Edward C., head-of-household, age 70, born May 1830 in North Carolina; parents born in North Carolina; married 36 years; occupation: farmer; owned farm (free). Henshaw, Mariah L, wife, age 57, born Feb 1843 in Missouri; parents born in Kentucky; married 36 years; 4 children, 3 living. Henshaw, Bright B., son, age 31, born June 1868 in California; father born in North Carolina; mother born in Missouri; married 5 years; occupation: farm laborer. Henshaw, Fannie D, daughter, age 22, born Aug 1877 in California; father born in North Carolina; mother born in Missouri; single; occupation: teacher, public school. Henshaw, Florence A., daughter-in-law, age 29, born Jan 1871 in Vermont; parents born in Vermont; married 5 years; no children. The tenth district is represented by E. C. Hinshaw of Petaluma. Mr. Hinshaw was born in Surry county, North Carolina, on May 30, 1830. His parents were also natives of the old North State. He is now engaged in farming and dairying, but in earlier life he taught school and sold goods in Petalume. He has resided in California for nearly thirty years and in Sonoma county all that time. He has served four terms in the Legislature - the nineteenth, twenty-first, twenty-second and twenty-fourth sessions. He educated himself at the Normal College, now Trinity, North Carolina. He is married and is the father of four children. He is a Democrat in politics and a member of the Christian Church. Hinshaw, E. C. A native of Yadkin county, North Carolina; born May 30, 1830; received his education at Normal College, in Randolph county, from which he graduated July 17, 1856. He then returned to his native county and taught school one term, and in January, 1857, he proceeded to Jackson county, Missouri, where he remained until the April following, when he, in company with his brother, W. P. and H. E. Lawrence, started across the plains, with ox teams, for California, and arrived in this county in October following. Spending the winter in Two Rock valley, Mr. Hinshaw embarked in merchandising in Petaluma under the firm name of Hinshaw & Co. After conducting this business for about eight months, he engaged in school teaching for some time, when he settled in Big valley and prosecuted farming three years, after which he located on his present farm, comprising three hundred and ten acres, in Two Rock valley, about three miles from Bloom-field. Mr. Hinshaw has served three times in the California Legislature. He married, July 1, 1864, Miss Lou Taylor, a native of Johnson, Missouri, born February 6, 1843. By this union they have three living children, James N., born April 18, 1865; Bite [sic] B., born June 14, 1868;' Fannie D., born August 12, 1877. One deceased, Mary A., born June 6, 1873, died August 18, 1876. "The History of Sonoma County, California". Biographical sketch of Edward Carter Hinshaw. 1900 census, Bloomfield Precinct, Sonoma County, California; roll T623-114, ED 155, page 22B, line #89, dwelling #40, family #40. 1870 census, Anally Township, Sonoma County, California; page 224, line #27, dwelling #99, family #91. 1860 census, Anally Township, Sonoma County, California; page 517, line #11, dwelling #278, family #279. Posting May 22 2002 by Jeanne () to NORCAL-L.
1870 census, Anally Township, Sonoma County, California; page 224b, line #26, dwelling #106, family #86. "California Information File", California State Library.